I got most of the Red done in Aug but with my computer down I did not post them. 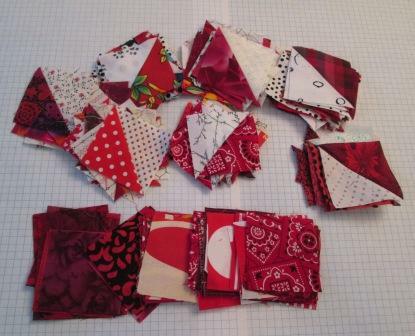 Here I have the Red coin strips done. They measure about 18" long and 6 1/2" wide. Should be fun deciding how I can use them, I do not have a real plan for these yet. Sorry for no blue yet. Maybe next week I can post more blue. I got three 6" crumb blocks done and a start on some more. 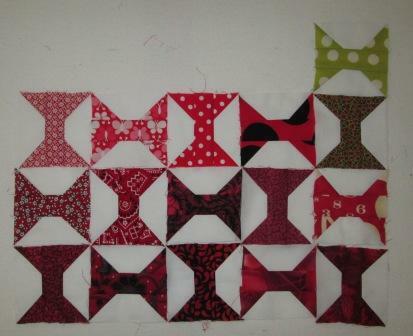 I got many triangles cut and prepared for a few different blocks but never got to sew any together. Also a little on the Red and Blue side. I have Raspberry and Blueberry turnovers. I have made these a few times this summer. I now have a little stash of the berry filling in the freezer and can make them up all winter long. I am not going to get much sewing done today, the weather is nice and I have to work on the fall harvest. I have tomatoes, squash,carrots and potatoes to come in. Good looking scrappy reds! And your turnovers look soooo yummy! Love your red blocks! 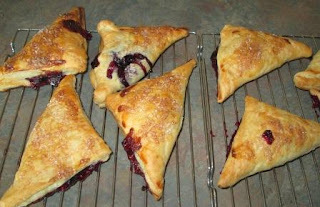 And pictures of your yummy turnovers! Yummy fabrics and yummy turnovers too! 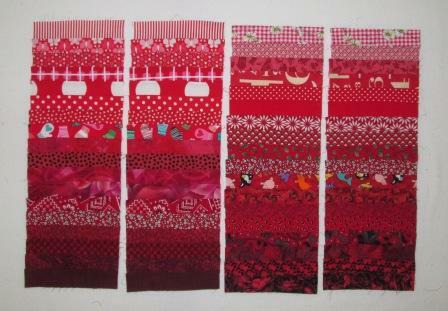 I'm having trouble moving on from red too... loving the reds! 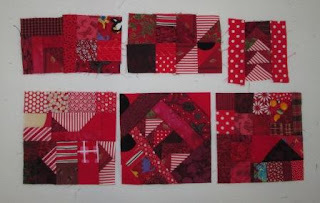 Great red spool blocks. I will be over for a turnover. Maybe I need to put make turnovers on my to do list. Those turnovers look yummy! Care to share the recipe? Your red blocks are looking great. the coins will tell you what they are to become when they are ready. Great collection of red. Hope you get it finished off soon, but fabric will keep better than the garden. if positioned correctly...those turnovers could be a "kind of" HST...... no? Yummy...the turnovers and your blocks. I think crumb blocks are a lot of fun.